Without further ado, I'd like to present a world map of bike-sharing programs. 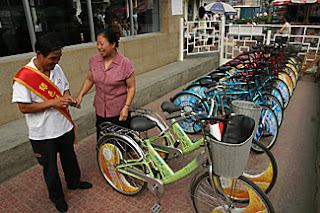 I have tallied a total of 62 2nd and 3rd generation bike-sharing programs worldwide. Per earlier research I'm defining 2nd generation programs as low-tech unattended coin-deposit release systems and 3rd generation as high-tech unattended smartcard or mobile phone release systems. As you can see, Europe is slightly in the lead, but Asia is not far behind. The list of these programs you will find on the right column of this blog. This year has seen the greatest expansion of bike-sharing programs than any other year. With systems like Barcelona's Bicing and the behemoth, Paris' Velib', bike-sharing is reaching a wider audience than ever before. NBC Nightly News has taken note of bike-sharing. The broadcast of October 26 showcased Paris' Velib' noting just how popular it has been and how even city officials are surprised that the City of Lights would also become the City of Bikes. One glaring error in the report was reporter, Keith Miller, explaining that "every large American city has expressed interested in bike-sharing except for San Francisco," as he's riding uphill in a Parisian neighborhood. Was this supposed to be an analogy showing why hilly San Francisco would not even consider bikes or bike-sharing? Well, this is not correct and NBC would have know this is they had viewed The Bike-sharing Blog on October 3. San Francisco is indeed getting its own bike-sharing program and has already selected the company to do it. An article titled "Montreal pedals way to 'self-serve' first" in The Gazette (Montreal) states, "The first city-issue self-serve bicycles will start to appear at specially designed outdoor bike stations in the fall of 2008. By the fall of 2009 [..], there should be 2,400 bikes available for rent for as little as $1 per half-hour of use at 300 stations around the city's central neighbourhoods, [Andre Lavallee, executive committee member responsible for Montreal's transportation issues] said." This won't be the first program in North America as D.C. is getting pretty close to launching, but it looks like it could be the first in Canada... unless those folks in Vancouver have something to say about it! Based on the number of bikes and investment (below), however, this could be the largest bike-sharing program in North America. "The city has commissioned Stationnement Montreal, a subsidiary of the Board of Trade of Metropolitan Montreal, to design and execute the bike rental system. The company, which currently manages the city's paid on-street and public parking lots, will invest $15 million to get the project up and running, and expects to eventually recoup these costs." "We used to see cycling as recreation, but now thousands of people are using bikes to get to work, or school. This summer, we actually saw traffic jams of cyclists on some of our new bike routes, like St. Urbain. 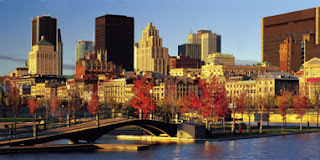 Something is changing right now in Montreal and we all have to come along on this wave," said Lavallee. According to The Portland Tribune, Portland, Oregon closed its bidding period this past Friday for a bike-sharing service and will be reviewing bids over the next few months. The fleet size they're looking for is 500 bikes and the city is open to the idea of either an advertising or non-advertising-based service. Where advertising is accepted, corporations like Clear Channel Adshel and JCDecaux have huge advantages as the millions of dollars they make on advertising revenues from bus shelters, billboards, and kiosks pay for bike-sharing. However, the smaller local companies have the advantage of being more responsive and knowing the local environment better. 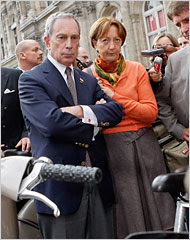 An article in The New York Times titled "In Paris, Bloomberg Eyes Bike Program for Home" reports New York Mayor Michael Bloomberg was in Paris in late September and fascinated with Velib'. Bloomberg "acknowledged the challenges of bringing home a popular Parisian bike rental program [...] saying he was unsure it would translate to New York. Noting challenges like roads damaged by seasonal changes, the lack of bike lanes, liability problems and the possibility that commuters would not want to carry helmets to work, Mr. Bloomberg said: 'You try to see whether it fits, and some parts of it will, but it may very well give you an idea to do something totally different.' "
Yes, there are challenges, NY, but nothing that the Big Apple can't overcome. Seasonal changes - Sure, but with bike-sharing programs all over northern climes like Helsinki, Stockholm, and Oslo; damaged roads haven't stopped them. Liability problems - The easy solution would be to evict all of NY's lawyers. However, just in case that's not possible, insurance and waivers are needed. Also, more bike safety education and more stringently enforced traffic laws are necessary. And fortunately for bike riders, helmets carry easily on top of one's head. "Scenario #1a shows that once Paris is finished installing all 20,600 public bikes, they will have more than doubled their cycling mode share in the span of a few months – increasing by 118% (from 1.63% to 3.55%). This result assumes that each public bike will be used for the current average of 6 trips per day and that there will be no concurrent increase in private cycling trips. It also assumes that 4% of public bike trips will replace private bicycle trips and that 2% of public bike trips would not have been made otherwise. Trips being shifted away from motor vehicles (~7%), walking (~37%), and public transit (~50%) are not factored into this model since they do not affect the overall number of trips being made. "Experience from Lyon suggests that a significant increase in private cycling trips is likely to occur as well since the public bicycle system acts as a “door opener” to increase the acceptance of cycling as an urban transport mode. If, in addition to the already-realized mode share growth described above, private cycling trips in Paris also increase by 50% (shown in Scenario #3a) - then Paris would achieve a 4.37% bike mode share representing a 168% increase over pre-July levels. "The remainder of the scenarios (#4-10) show what would happen to mode share if the number of Velib bikes was doubled, the number of trips made per day on Velib bikes was doubled, and the number of trips made by private bicycle increased by 50%, 100%, 200%, and 400%. The final scenario shows that for a 15% mode share to be realized, the number of public bikes would need to be doubled (to 41,200), the number of trips made on each bike per day would need to be doubled (to 12), and the number of trips made by private bicycle would need to increase by 331% - or some combination thereof. "Playing around with this very basic model (e.g. changing number of public bikes, number of trips, rate of private cycling increase) starts to give a rough sense of the scale of mode share change that could be realized through a public bike system." "If you are on the hunt for love in Paris, forget cafés and art galleries and rent a bicycle instead. Residents and visitors have found that the city’s new self-service bike scheme offers the best chance of flirting with strangers. 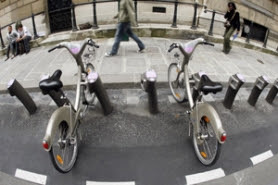 "The emergence of a two-wheeled mating service has been one of several unintended consequences of the runaway success of le Vélib’, the sturdy grey bicyclettes that the Mayor of Paris, Bertrand Delanoë, unleashed on the streets in mid-July." Look-out on-line dating services! You've got new in-line competition. With all the matching, Velib should begin to offer tandems. San Francisco - America's First Bike-sharing Town? In the October 3rd San Francisco Chronicle, an article titled "S.F. moving to catch up with European bike-share programs" was about San Francisco's efforts to start bike-sharing. Clear Channel Adshel won the advertising rights on S.F. 's transit shelters and will be providing the bike-sharing service as part of this contract. I understand from the author of this report that a definitive number of neither bikes nor stations were not mentioned in the contract. Clear Channel won Washington, D.C.'s contract and will hopefully be starting a bike-sharing program with only 120 bikes at 10 stations, after two years of waiting... waiting. Now that we're in a new era with programs in Europe that are measured in the thousands of bikes and hundreds of stations, it's absolutely necessary that American programs are measured in the same way. If a small program like D.C.'s fails (which I don't believe it will), it can't be said that bike-sharing in America doesn't work because America doesn't bike. This would be incorrect. A substantial program must be made to ensure that it succeeds. Velib' in Paris will carry as many passengers as the tram system by the end of the year when it has all 20,600 bikes up-and-running because an equal commitment was made to bike-sharing that was made to the tram. Why shouldn't San Francisco have a bike-sharing program equal to Paris's? I don't see any reason why not? Paris had a bike mode share of 1.63% before Velib'; it's probably tripled or quadrupled since July. S.F. 's bike mode share was about 4% in 2003. This leads me to believe that bike-sharing would be even more well-used in S.F. 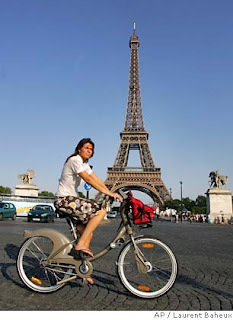 Paris has a population of about 2,200,000, or 107 people per bike-sharing bike. San Francisco has a population of 750,000, so why not have 7,000 bikes for the same ratio as Paris? This would make San Francisco's bike-sharing program the second largest in the world and deservedly so for the great city.